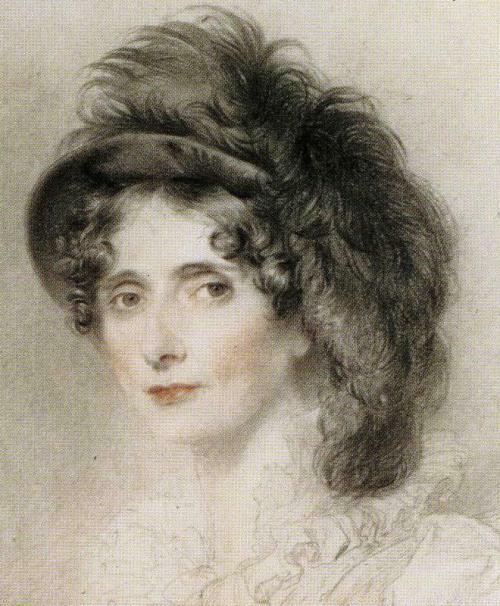 On May 28 1812, Elizabeth, the Duchess of Devonshire, writes to her son Augustus Foster, the British Minister Plenipotentiary to the United States. Again, Miss Annabella Milbanke is discussed.
. . . The Prince Regent was there, and in pretty good spirits, the crowd and heat enormous; — but now your eyes have wandered over this for a name more interesting. Well, Annabella was there; Annabella looked well; Annabella and I got more acquainted than I have done yet. Caroline called her to sit by her. I made room, and we all three sat on a couch. I liked her countenance and manners. Old twaddle Ralph [Sir Ralph Milbanke, Bart.] and I are all cordiality, and Lady Milbanke called her daughter to speak to me, who said, "I had the honor of talking to the Duchess " — which we had in the further room. She did not ask me about you, which I was glad of; indifference would have made her inquire out of civility; the father did.